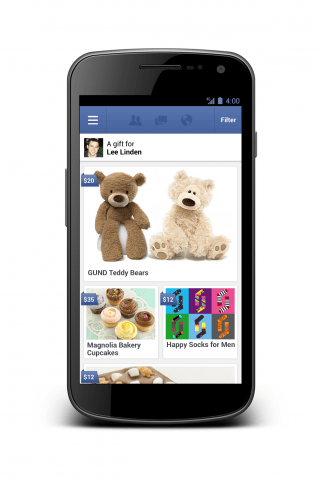 Is Facebook Gifts the next big revenue source for the social network? Facebook has unveiled a new service called Facebook Gifts that will allow users to purchase and send real-life gifts to other members. The social network said members would be able to buy gifts as part of birthday reminders or by simply visiting someone’s Timeline. Gift selections for would-be shoppers are limited to just a handful of items at launch including Starbucks gift cards, cupcakes, chocolate bars and stuffed animals but Facebook says more items will be added on a daily basis. Gift-givers can post the present directly to the recipient's Timeline or send a private message. The lucky individual can then “unwrap” the item and either elect to keep it, exchange it for something in a different color, size, flavor or choose something else altogether of equal value. Payment for gifts can be made at the time of purchase or buyers can elect to be billed later. Once a gift notification has been received, the recipient will need to supply their mailing address at which time they should receive the gift within a few days. The service is a direct result of the Facebook’s acquisition of social gifting mobile app company Karma. The social network paid an undisclosed sum of money for the company and its 16 employees on the same day their IPO went live back in May. Facebook began rolling out the feature to US residents today and will continue to do so gradually moving forward until everyone has access. Only time will tell if this extra revenue stream will make much of a difference in the eyes of investors.